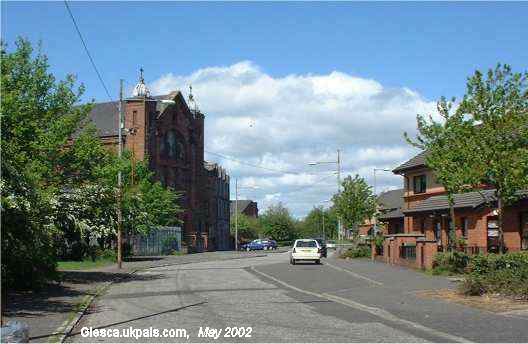 Old Dalmarnock Road looking north towards Bridgeton Cross. 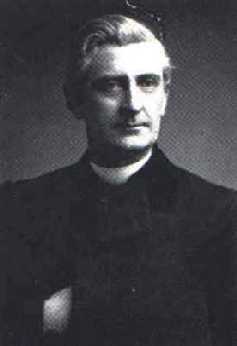 Canon Francis Joseph Hughes, born 5th August 1845, parish of Tyholland, County Monaghan. Educated at St.Maconlon's College. Monaghan and All Hallows, Dublin. Ordained Priest 24 June, 1870 at all Hallos College, Dublin by Bishop William Lanigan of Goulbourn, New South Wales for Western District of Scotland. I just wanted to thank you for the Glasgow south east memories. I was born and lived at 302 Main St. Bridgeton, and lived above the co-op butchers until 1949. 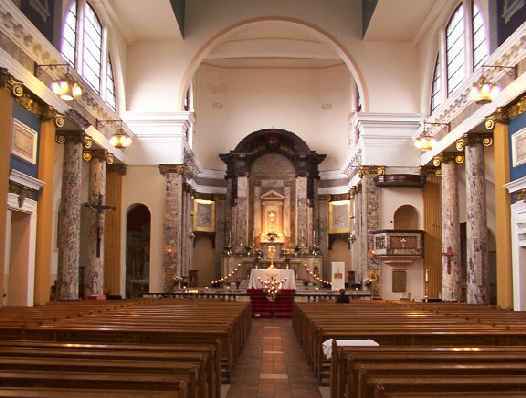 I went to Sacred Heart school and it was so nice to see the inside of the church as i served as an alter boy there for about 3 years. Thank you again. sat on this same site for 100 years now. This photo shows the church with the school to the rear. Behind the school Savoy Street runs down to the Main Street. It was on Savoy Street that kitchens were established by the Saint Vincent de Paul Society in association with Brother Walfrid, to ensure easy access for free school meals to encourage children to attend and stay at the school. These Poor Childrens Dinner Tables proved a success but costly. Walfrid started organising football matches in the nearby Glengarry Park to raise more funds and ultimately, decided that the city deserved a football club of its own with the objective of supporting these tables, which had taken off at St Mary's and other schools in the East End. Members of a Catholic parish with strong historical links to Celtic Football Club are celebrating their church’s centenary today after carrying out £12,000 worth of repairs by themselves. 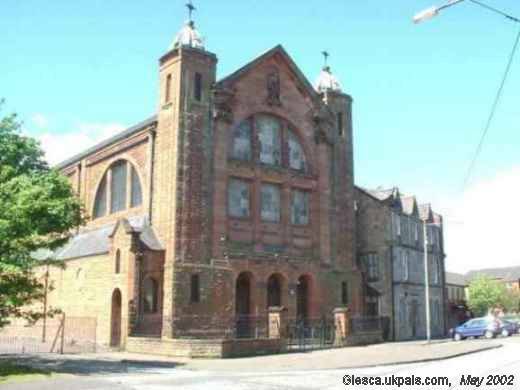 Sacred Heart of Jesus church in Bridgeton in the east end of Glasgow has been restored inside thanks to 600 hours of unpaid work by members of the congregation, who have been coming in at weekends since March to return the church to its Edwardian grandeur. The stone church was built in 1910, but the parish itself was founded in 1873. The parish school next door, also called Sacred Heart, was run from 1874 onwards by Brother Walfrid, a Marist Brother and the founder of Celtic Football Club. He started a football team in 1876 for local boys, to keep them occupied in the evenings when their parents were still out at work. Twelve years later, he founded Celtic FC to raise funds for his charitable work with the poor of the east end. Celtic FC have sent a message of congratulations to Sacred Heart in advance of its centenary celebration. Tonight, Archbishop Mario Conti will preside over a special Mass attended by politicians, police chiefs and local people, followed by a reception at Sacred Heart Primary School next door. The centenary takes place on the feast of the Sacred Heart, as the church was opened on the same occasion in 1910. Like many other Catholic churches, Sacred Heart has experienced a decline in numbers in the last 25 years. Built in the Roman basilica style, it has a capacity of 800, but current Sunday attendance stands at about 180. This has resulted in pressure on church finances. However, the dozen-strong team of parishioners have transformed the peeling paintwork, cracked plaster and grimy paintings with months of washing, steaming, painting and polishing, preparing the way for professional plasterers, thereby reducing a repair bill of more than £20,000 to less than £10,000. The parish priest, Father Stephen Dunn, has spent his Saturdays up a ladder with buckets of water cleaning years of grime off ornate plasterwork and then carefully repainting it in scarlet and gold. Dunn, whose family has lived in Bridgeton for four generations, said: “There are a few areas of Glasgow that have been core to the building of Glasgow as a city and this is one of those areas. “You can see the beauty and the majesty of this church now. When it was built, people gave of their time and raised money – in spite of their poor back-ground. They were testing times, but there was a great sense of community. That showed people’s commitment to a spiritual life. Susan McSorley, who is in her seventies, has been coming to Sacred Heart for 33 years. She is a member of the volunteer team, which she described as “a big happy family”. The church has been a target of sporadic sectarian attacks over the years, according to Dunn. As a consequence, several panes of glass have been replaced with perspex on the church house after being broken, and grilles cover the lower windows. Bridgeton had a Catholic community from the late 18th century onwards following an influx of Highlanders, chiefly Macdonalds, who came to the area seeking work in the cotton industry. Their arrival led to the area becoming known as Glengarry. 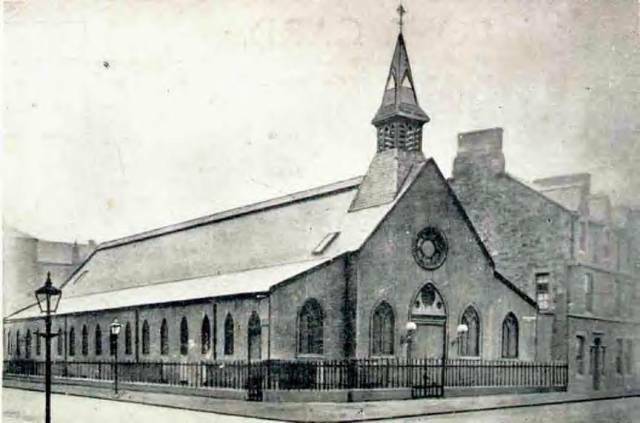 Celtic FC was formed after a meeting convened by Brother Walfrid in the church hall of St Mary’s, Calton, in November 1887.